THIS IS OUR fifth Christmas at Second String Music. For the first four years, and the last couple of weeks, Sheryl and I decided to stay open later to give shoppers more time. We extended our close time to 7 p.m. and experimented with later hours. It hasn't really changed a thing. After 6 p.m., we have done very little business, except for one night when we had a customer drive past the store and happen to see the open sign. Experimenting with open/close times can be tricky but each year we try to get better. There are destination spots and entertainment venues open late. The District worked hard as always to promote downtown businesses and encourage people to come out after work. It's not a big deal to us, staying until 7 p.m., because I often have lessons until that time and Sheryl is here anyway. And in the small business world, opening early and staying late are part of the deal, and we don't mind a bit. I can't tell you how many times we have somebody call us minutes before we close and ask if we can stay open a bit longer. No problem - we are here to help and serve! Last week we came in early and had customers in the store between 9 and 9:30 a.m. So this week and this week only, we will open at 9 and close at 6, our regular closing time. We will close at 5 p.m. on Christmas Eve. If you need us to stay late, call the store and let us know. We don't mind - (217)223-8008. Christmas is our biggest time of the year and we have met some great family's and sold lots of instruments. It will be good again this week, and we still have all kinds of great stuff for the musician, from beautiful Breedlove, Luna and Dean guitars to tuners, strings, drumsticks and picks. 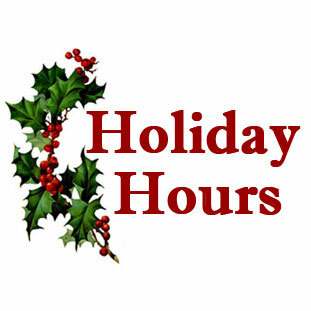 We are closed Christmas day, of course, but will be back at it Saturday from 10 a.m. to 6 p.m. It is a balancing act for us. Making sure we have our own time and still making sure our customers have time to shop. Come by and visit.